I’ve mentioned my office setup – specifically this desk/laptop/phone setup to a few folks and heard enough “tell me more” interest to feel like it was time to put pen to paper… er. Fingers to keyboard? Anyhow, here it is in all its glory. The laptop and screen aren’t really anything to write home about – 13 inch Macbook, 23 inch Asus external monitor currently elevated using phone books (finally found a good use for them!). The desk is really where the action is. 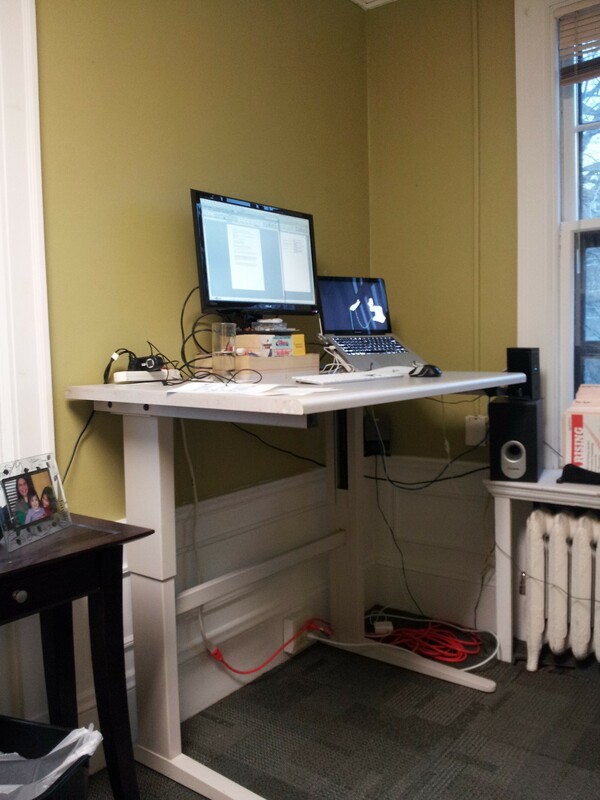 It’s an adjustable desk, meaning that I can crank it up and down from sitting to standing height and back down again. I bought it for the princely sum of $75 via craigslist and I have to say that I absolutely love it. As you can see, I stand for pretty much all computer related work. I find that I’m a lot more productive, and my back feels a million times better. I find that standing, I move around more, shifting position, pacing in place a bit, and that my arms and shoulders are way more comfortable and relaxed than they ever were when I was at a sitting desk. What it also means is that I have a sitting area at my other desk that’s dedicated to phone calls. Yes, that means that when I’m on the phone, I’m not in front of a screen. If you just gasped and wondered how I fiddle around on facebook or look at email or otherwise “multi-task” you just grasped the point – I don’t. I do a TON of work via phone. Focus and presence are critical. When I’m on the phone with you, I’m on the phone with you. With this set up, I have the focused computer time that support my thinking, doing, and physical comfort, and I have space that support full attention and focus when I’m on the phone. Having lived with this set up for several months now, I have to say that it’s really just about perfect for me. Small additions in the not too distant future may include some sort of mat under the standing desk because I work w/out shoes and my feet get cold, and some sort of headset because it’s hard to take notes while you’re holding a telephone. Small things really. All in all, it’s a lovely set up that I’m always happy to see when I walk in the door. Pamela Chiang liked this on Facebook.